It's that time of the year again - the mid-autumn festival. In Chinese calendar, the 15th of September this year marks the middle of Autumn season in China, and the full moon shines brightly blablablablabla ah, who am I kidding. Let's just cut to the chase - MOONCAKES! Don't get me started on mooncakes. As our loyal readers might have noticed, I'm nuts about mooncakes. In fact, my affection towards mooncakes is so hyperbolic and beyond norm, they might as well hire me to be a spokesperson of the Hong Kong mooncake industry. Apart from Christmas and Chinese New Year, I don't think that there's any other occasion that makes me jitter in sheer expectation of consuming something other than this mid-autumn festival. My father felt utterly terrible. Anyway, that is a difficult craving to fulfill because of many reasons - for a start, original Chinese mooncakes aren't even that popular in Indonesia in the 1980s - even if it was in the middle of mid-autumn festival, chances of getting real mooncakes in Jakarta is quite slim. But on the other hand, the Chinese view pregnancy cravings as something that must be fulfilled without question - or bad luck may befall the child or the mother, or even the whole family. Suddenly, my father remembered his friend who is in the confectionery business. He gave this friend a call in hope of some clues on getting some mooncakes. Just as he did that, a flicker of hope shone - this friend of his knows someone who owns a small mooncake factory in Semarang, Central Java. That very evening, my dad and his friend embarked on a ten-hour drive to Semarang in search of this acquaintance. As they arrived in Semarang the next day, tired and exhausted after the long drive, they found out that the factory was closed. They got to meet the factory owner, but he didn't have any single stock of mooncake left since mid-autumn festival was months away. My father asked the owner to make a batch of mooncakes especially for him, but unfortunately, as all of his mooncakes are produced by machine, it would be too much of a trouble to get the whole factory operating just for a few boxes of mooncakes. But my father pleaded and begged, he even offered a very generous compensation and said that his wife is in a state of despair. The owner was touched and finally agreed to make some mooncakes just for my father. So, he went back to Jakarta, carrying with him enough mooncakes to last my mother's whole pregnancy period - and when my mother saw those boxes of mooncakes, her face lit up, brighter than the moon, as my father recalls - and smiled in utter bliss. She ended up eating about eight boxes of mooncakes - that's 32 pieces of mooncakes, before she finally got over her craving - and a few months after that, I was born. 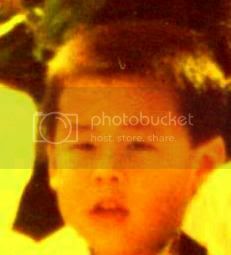 It was said that my face was as round and as red as a mooncake when I was born - and all ends well. There you go. That's why I'm obsessed with mooncakes even as an adult - and mid-autumn is a time for joyous celebration for myself as I get to stuff my face with as many mooncakes as possible. Okay, now that we've got the history sorted, let's talk about this year's mid-autumn festival in Sydney. Look, to be honest, I don't even give a tiny rat's a$$ about the events surrounding mid-autumn festival - all I care is the mooncakes. The previous 3 photos was taken at Market City at Haymarket, where every year they put up this mooncake stalls selling mooncakes from all over the orient. Hong Kong is, of course, universally known as the producer of the BEST mooncakes on earth, and I wouldn't have it any other way - Hong Kong mooncakes is still the only way to go. Of course, there are lots of exquisite mooncakes from other countries as well, like Singapore - but most good mooncakes in Singapore are sold in 5-star hotels. There are mooncakes from the 'new world' as well (I'm using wine terminology here - and when I said 'new world' in this context, I mean countries like Malaysia, Vietnam, and Indonesia which have just begun manufacturing mooncake SERIOUSLY for exports since last decade or so). Malaysian mooncakes have gorgeous packaging, but the taste is so-so. Vietnamese mooncakes still have a long way to go to be in the same league as Hong Kong's or Singapore's. Note: This box of mini mooncake is supposed to be a 'preview' mooncake for me. Before having the 'big guns', why not start with the quaint ones. Mini mooncakes aren't as good as regular-sized mooncakes, because of their flawed crust-to-filling ratio. Traditionally, mooncakes are baked in approx. 9 centimeters diameter size, and there's a good reason behind that. When baked, the traditional-sized mooncakes will yield a perfect crust-to-filling ratio, so the filling and the yolks will remain perfect as intended (slightly moist with just a hint of oil). Mini mooncakes, however, tend to end up rather dry. Note: Last year, I bought Maxim's snowy mooncake, but this year, I've decided to go for Wing Wah since they've just launched their snowskin mooncake this year. The packaging is quite nice and unusual, too. This box comes with 3 flavors: Blueberry, Apricot Jasmine, and Red Bean. I rather like this one compared to Maxim's - the Apricot Jasmine is exquisite. 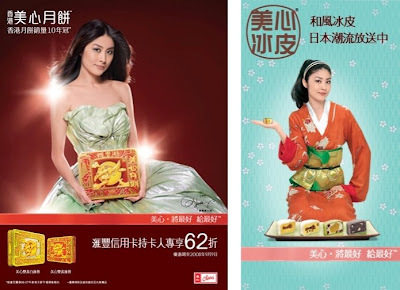 First of all, Maxim is my favorite brand of mooncakes - and how ecstatic I was when I found out that this year, their spokesperson is none other than my all-time favorite Hong Kong celebrity, and possibly one of my favorite human being on earth - Kelly Chen! I've been a huge Kelly fan ever since I was in middle school - at the early years of her career. Ah, those years of reading Yes! Magazine (hand-carried from Hong Kong every month by my dear aunt because they don't sell it in Jakarta), cutting up pictures of Kelly from those magazines and collecting Yes! Cards with Kelly's pictures on them...she's always been my absolute favorite. I'm so glad Maxim dumped last year's spokesperson, Joey Yung - and I hope it'll be Kelly again next year. The standard, classic mooncake, and also Maxim's best seller of all time. My absolute favorite mooncake. White lotus seed paste is a more refined lotus seed paste, and the texture is just amazing beyond words. It's absolutely exquisite. I had my doubts on this one - after all, red bean paste (dou sha) is a very common ingredient in Chinese pastries. However, it turned out to be quite good. The texture is rather coarse, but it's really fragrant and light. On the time of writing, I haven't opened this one yet...LOL. I seriously have doubts on this one. Seriously, once you go lotus seed paste, you won't settle for anything else. Traditional mooncake is still the best way to go. ...and the red bean paste. So basically, 52% i.e. half of it is just pure SUGAR and FAT. Thanks for the review. Wish I can have the mooncakes right now! I love Hong Kong's mooncakes but since its far away and I have to fight over to get a can with my family, now that I don't travel much, I will settle for Singapore's. Yes, you can easily find Maxim and Kee Wah in Singapore...try Ngee Ann City. Yes, you're rite...most of them are Malaysian ones...Even in the expensive bakery, tetep aja pakenya yang Malaysian. Iya, Marriott (alias Pearl) bikin every year yah (at least for the last two that I've been in Indonesia). As usual,kemasannya mewah, malah ada patung tikus-tikusannya dengan alas crystal-like gitu... But dunno, kinda want the asli one... Nothing's wrong with all the hotel's ones. hate me now, hate me later.. but i don't like mooncakes! DIAN! Stop being so BLASPHEMOUS! ..but egg yolks (cooked) = food, mooncakes = dessert, and the OCD in me can't stand them touching each other.. Let alone eating them together in one bite! Excyuuuse me, madam, who's telling you to eat the one with yolks?? There ARE mooncakes that has no yolks, you know. In fact nowadays, they put ANYTHING in mooncakes - including ham, cheese, even truffles (the fungus, not the chocolate). They also put NOTHING in mooncakes - it's your choice. I personally am not too crazy about mooncakes with yolks either, mind you. That's why most of the time I would buy the ones with no yolks. ...although I wouldn't go as far as saying that yolks "food" and cakes "dessert" don't go with each other. I completely disagree with that. Nonono I know that the Raffles mooncake is filled with chocolate truffles - I was talking about other mooncakes - I've seen some mooncakes that has fungus truffles filling. Seriously.